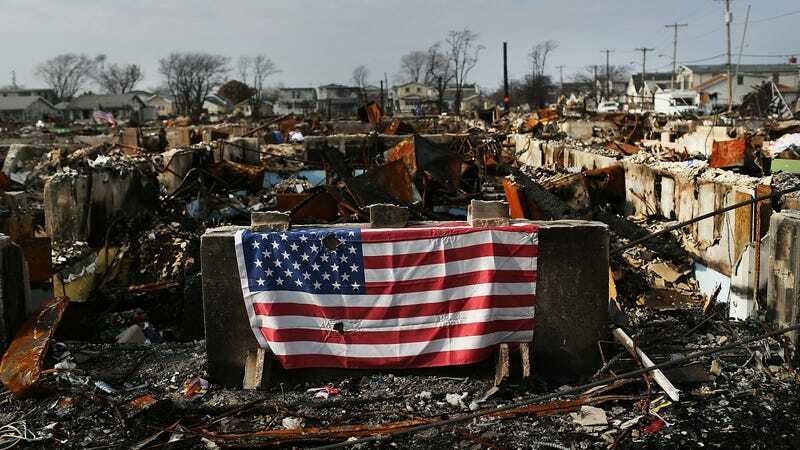 An American flag in the Breezy Point neighborhood in the wake of Hurricane Sandy. America is already great, my friends, at least when it comes to climate denial. New research published this week in Nature Climate Change shows the U.S. is without peers when it comes to denying the basic science of climate change. Scientists surveyed people in 25 countries around the world, and found there’s no country quite like the U.S, where climate denial is much more closely tied to one’s political persuasion than any other country. The researchers say this is actually a good thing, because it means there’s nothing inherent in conservative ideology that causes people to reject science, or that stands in opposition to making efforts to reduce emissions. Previous research in the U.S. has shown how climate denial tends to be strongest among people who are conservative and fall into the “hierarchal individualist” ideological category, which is essentially your Gadsden flag-loving types. The thinking is that their preference for traditional power structures and individual freedom colors their acceptance of climate science. Basically, it’s easier to question climate science than accept its conclusions, because to accept the science would mean acknowledging the need for top-down actions to preserve the communal resource of our planet. In an effort to determine if this pattern holds in other countries around the globe, scientists from the University of Queensland in Australia sent a survey to 5,325 online participants in both developed and developing countries. Questions probed their ideologies, political beliefs, and belief in conspiracy theories. The survey then asked participants about their perspectives on climate science. The results show that while there are climate deniers in other countries, the U.S. is truly special. “The data demonstrate that the relationship between conservative ideologies and climate scepticism is unusually strong and consistent within the United States compared to other countries,” the researchers wrote. Conservatives in Australia, Brazil, and Canada also show a proclivity for climate denial, though not at the same levels as the U.S. Outside of the oil-producing countries in the Middle East, Australia, Canada, and the U.S. have some of the highest per capita carbon emissions in the world. Factoring in deforestation and you can put Brazil near the top of the list, too. The researchers’ analysis showed that these countries tend to have stronger connections between climate denial and conservative, individualist, and hierarchical ideologies. They posit that citizens in countries with high per-capita emissions could all have “vested interests around climate change,” which makes sense. What makes the U.S. stand out has been a concerted effort by the fossil fuel industry to influence the public and policymakers at the highest levels of government to question the science and delay acting on climate change. It’s been remarkably effective, and we’re still dealing with the fallout today with a president who has openly denied climate change and expressed his intent to take the U.S. out of the Paris climate agreement. At the same time, the number of moderate Republicans that accept humans are causing climate change has shown a pretty notable uptick in the past year, so maybe we’re not totally doomed to a lifetime of squabbling over basic science. The study itself also has a glass half full takeaway if you want one. According to the researchers, “in these samples at least, one can be optimistic that climate science is more likely to be appraised on its merits, rather than being tainted by the desire to reach conclusions that are compatible with one’s worldviews,” at least for the rest of the world outside the U.S. That means we’re not likely to see political parties abroad suddenly deny climate change.